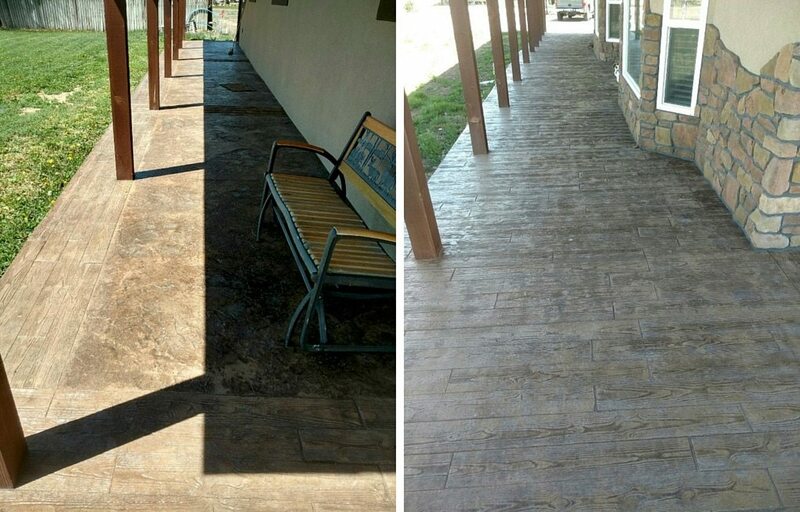 Stamped concrete is a creative and affordable way to enhance any exterior or interior space. Also known as textured concrete, the process replicates the high-end look of stone, brick, tile, cobblestone, pavers and even wood, often at lower cost than the materials it mimics, making it especially popular with homeowners. The wide variety of decorative concrete options knows no bounds when it comes to pattern and color. Stamped concrete is often used to beautify patios and pool decks, front porches and entryways, walkways and driveways, just to name a few. Many homeowners and businesses even use stamped concrete to make a dramatic statement on interior flooring and accent walls. 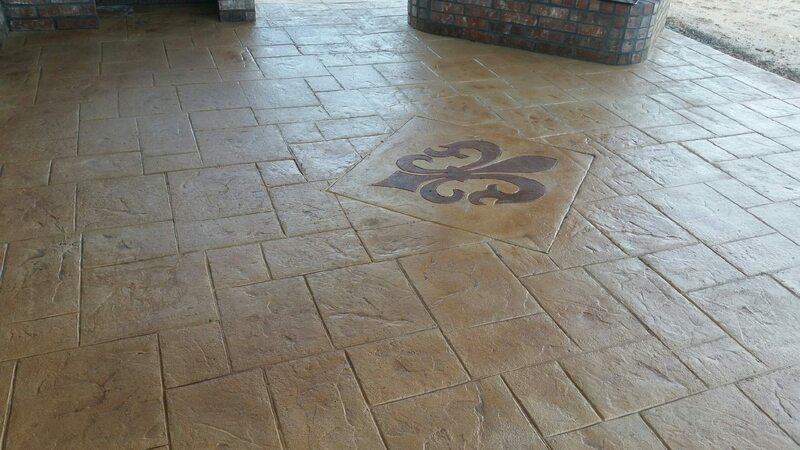 With so much potential for customization, stamped concrete has a high “wow” factor. Aesthetically, stamped concrete is hard to surpass when it comes to customization of pattern and color. Pattern sets the tone for the overall design so it’s important to choose one that achieves your design goals. When done well, stamped concrete can be indistinguishable from the real thing. Most stamping mats are molded from the actual materials they mimic, adding a realistic element. Click here for tips on choosing texture, color and pattern. Preparation is always key to any concrete project. Maintenance is typically low, requiring only occasional reseals. A high-quality sealer can protect your investment against efflorescence, moisture and the elements, keeping it beautiful for years to come. Another benefit? No grouted joints for weeds to sprout through, which can require tedious maintenance when it comes to traditional stones and pavers. Decorative concrete can be less costly than high-end stones and pavers, depending on the complexity of the project. A single color and pattern can be more cost-efficient than multi-pattern and color designs. Simple stamped concrete can be poured in less time than it takes to place stones or pavers. While the process can be labor-intensive, it’s a different type of labor than the heavy and tedious placement of stones. Time is money, so even in cases where the materials break even, there’s often savings in labor. Integral color is one of the most popular color enhancements for stamped concrete. The admixture infuses concrete with rich, long-lasting color. Layering colors, color hardeners, and chemical concrete stains can add natural variations to more realistically replicate natural surfaces. 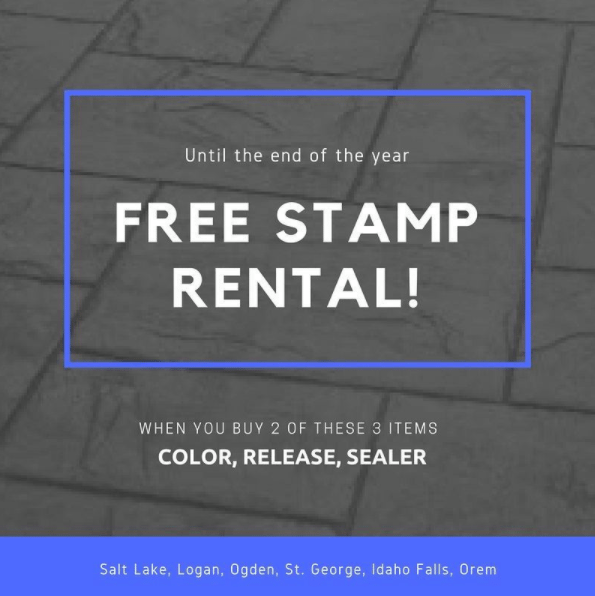 Through the end of 2017, Intermountain Concrete Specialties is offering a great deal on stamped concrete. 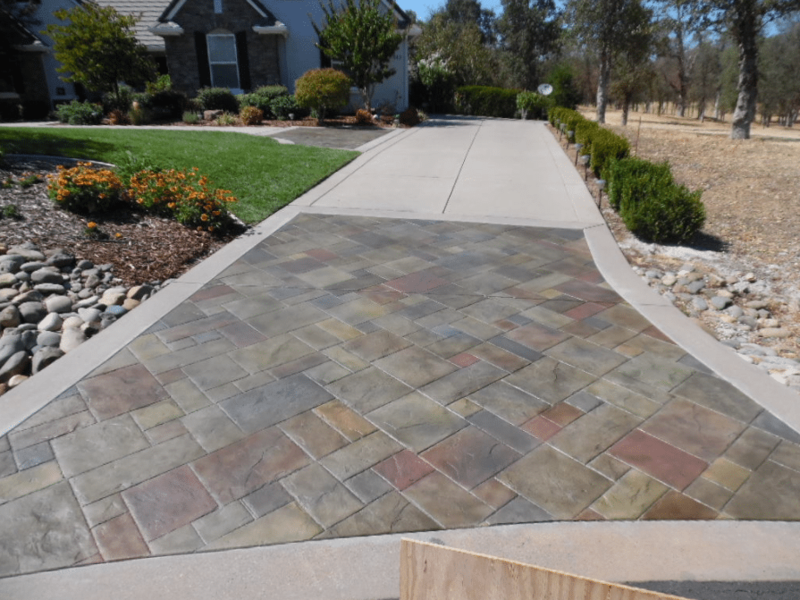 Get a free stamp rental when purchasing two of these three decorative concrete products: color, release and/or sealer. We carry a complete line of high-quality stamping tools and seamless texture skins, borders and touch-up tools from trusted brands like Innotech and Brickform. For more information on the products, tools and equipment needed to achieve a high-end stamped concrete look, visit one our six showrooms in Utah and Idaho.